Survivors of the Titanic, Empress of Ireland and Lusitania are now gone. 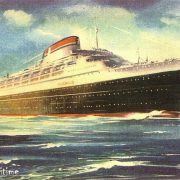 The next three major wrecks that still have survivors are the Morro Castle, the Athenia, and the Andrea Doria. 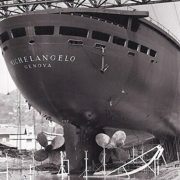 The Andrea Doria captured everyone’s attention due to the fact video of her sinking was televised. The author, Pierette Simpson, was a pre-teen moving to a new life in Michigan with her grandparents when the ship sank. 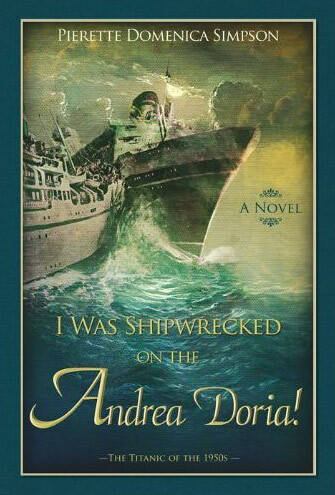 Years later, she wrote Alive on the Andrea Doria, a book praised in the maritime community for being well researched and providing much new information regarding the shipwreck. Read The sinking of the unsinkable also by Pierette Simpson. Simpson has come back with a novel for young adults similar to her previous book. The book is part autobiographical and part fiction. We see the Andrea Doria‘s final voyage through her nine year old eyes as she and her grandparents mingle with their fellow passengers. Most of the characters are semi-fictional. The Marinos are based on the Mastrincola family, the Holmes are based on the Hills, the Yates are based on the Youngs, etc… This helps the narrative flow better, as their interactions seem more natural as do the conversations. The book starts with Simpson, then Piera Burzio, and her grandparents leaving their small farming town for the long trip to the pier. As they settle aboard the ship, we see their amazement of things that were uncommon in Pranzalito such as ice sculptures, swimming pools and buffet tables. Similar themes are found in the story of the Titanic as well. In fact, the character of Mr. Yates explains the story of the Titanic to his son. He also reassures Mrs. Burzio that the Andrea Doria is pretty much unsinkable. It foreshadows the coming disaster. 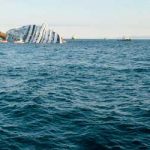 Readers will appreciate the life or death struggles of the Doria’s passengers and crew when she collides with the liner, Stockholm. It was not a matter of just stepping into a lifeboat. People had to slide down ropes, climb ladders or in some cases swim to a lifeboat. The book works well to interest readers of all age groups in ships and shipwrecks. They will not be disappointed that there is no Jack and Rose. Those who have not purchased her previous book, should purchase both as they compliment each other well. https://www.garemaritime.com/wordpress/wp-content/uploads/2012/04/morro-featured-13.jpg 459 599 Michael Poirier https://www.garemaritime.com/wordpress/wp-content/uploads/2016/05/gare-maritime-logo.png Michael Poirier2012-04-01 15:01:152016-05-11 06:58:40I Was Shipwrecked on the Andrea Doria!